“MAKE AWAKE” was created as part of Myrna Keliher’s debut interdisciplinary art show, “Awake,” at Core Gallery, Seattle in June 2017. 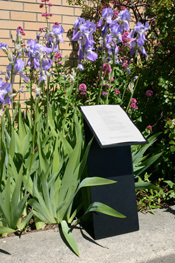 The limited-edition linocut, along with scores of other Cascadia-author broadsides and books, was printed by Expedition Press in Kingston, Washington. The words seem an apt salute to the New Year. All best from The Poetry Department for a richly poetic 2019.